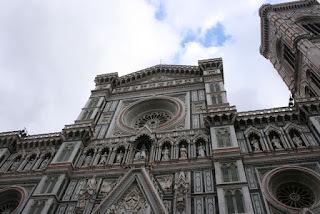 Today is Epiphany, and I thought it was a good time to go back into the archives for this post about Epiphany in Florence. Enjoy! The Twelve Days of Christmas mark the time between Christmas Day and the beginning of Epiphany, the celebration of the Wise Men visiting the baby Jesus. 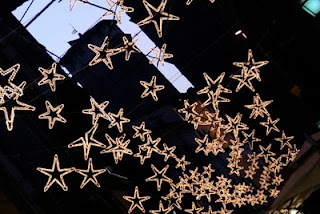 In Italy and many other European countries the season between Christmas and Epiphany is a time for family and friends. Shops and businesses close or have reduced hours, and families gather for celebrations together. The festivities culminate on Epiphany, January 6. 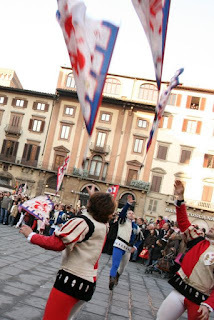 There's no place I'd rather be for the start of Epiphany than Florence, Italy. The city's twinkly lights are festive and bright. The city center is filled with charming shops and pedestrian streets. But that's not the real attraction. 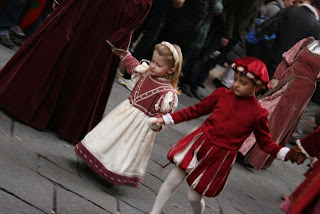 On Epiphany Firenze (Florence) stages a live creche in front of the Duomo and a parade of Florentines -- including three kings -- in Renaissance costume make their way across the Arno and through Piazza della Signoria to the Duomo to pay their respects to the Christ Child. 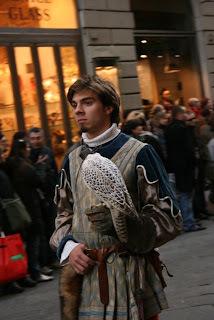 With falconers and flag throwers, peasants and princesses, the pageant is a marvelous celebration. And because it is the end of tourist season, the celebration is truly for Firenze's faithful -- the men and women and children who live and work in the city, not the tourists. 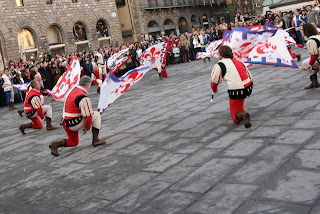 The shops close, and thousands of people gather to watch the costumed participants. And once the parade passes, people fall in line behind making their way to the Duomo heralded by the ringing of the church bells. Enjoy your own Epiphany celebrations, wherever you are. 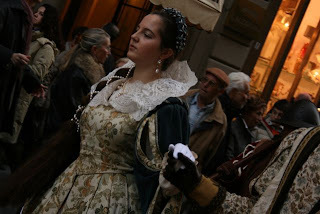 PS: I took these photos during the 2007 Epiphany celebration in Florence. In doing my daily blog reading, I found two great posts about Epiphany to share with you. Buona Bufana: at Over a Tuscan Stove, Judy writes about La Bufana and making candy that looks like coal for your stockings. Cavalcade of the Magi: Roberta who is traveling the world writes from Barcelona with a great photo tour of that city's Epiphany celebration. Beautiful! Thanks for sharing! WOW! I love Florence & there is definitely something magical about being in a beautiful European place away from all the tourists & authentic Renaissance costumes! We stumbled upon one in Rothenberg, Germany on the Romantic Road last fall which was an awesome reenactment by and for locals! We adore the 3 Kings celebration in Spain that takes place on Jan 5 & 6th, most particularly in our tiny white village by the sea. Everyone in the community participates, so that is what makes it very special to us.It's a much earthier take & suits this location tucked into majestic mountains. We all walk together down the ancient very narrow streets, 3 Kings on horses ( friends we know) singing together the traditional carols, local marching band playing with the postman, school kids, cop etc in it, my daughter's class mate dressed as Mary and riding a donkey, fire works going off, candy being thrown to kids & the sun setting as we go! We all end up at the town hall at the end where every single child in the village receives a gift from the 3 Kings! We will truly miss the symbolic traditional rituals of Europe & how they create community that way when our world tour leads us in other directions! Ooh, how I'd love to be part of that celebration. I so miss the Kings Cake from our French life--both the taste and the symbolism. JUST gorgeous!! i'd love to be there then. thanks for the inspiration! 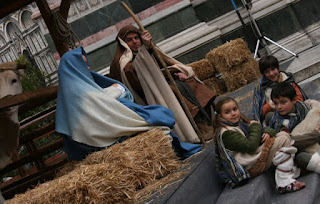 Soultravelers3: I just added a link to another blogger's account of Spain's Epiphany celebrations. JessieV: Italy is marvelous between Christmas and Epiphany. I highly recommend it! Becky: I'd LOVE to be in France! Though you can get a good Kings Cake in New Orleans,too.